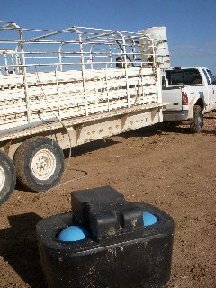 Automatic Waterers Can Make It So Much Easier! Camping with horses was such a treat when we were little! Our families would trailer up to the mountains outside of Colorado Springs, and we would camp and ride and relax in the big trees, tall meadow grass, quiet dark nights, beside those proverbial babbling brooks. It was nearly Heaven!! Janice Vincent enjoying a great camp-nap! 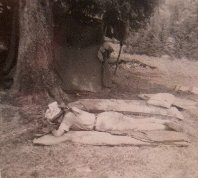 Over the years, our camping continued; often we would have a clear, clean stream for water close by, but often it was quite a hike. Back then there was not as much worry about contaminated water, and there were not the wonderful water containers that today we take for granted. 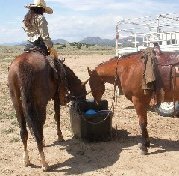 Many horses absolutely refuse to drink ''strange'' water, and people go to great lengths to coax them..... putting peppermint drops in the water at home for a few days before going camping or to a horse show can do the trick...those same drops are then put in the ''strange'' water. More than 20 years ago, a very clever person invented the perfect automatic water system, Mirafount. I'm sorry I did not know about them way back then, how much water and time and hassle we would have saved!!!!! NOW we have discovered a fabulous system for traveling, camping, or even just a day trip.... like spending the day on the movie set for a 48-hour movie project. Others were hassling with buckets, hoses, knocked over water tubs, carrying heavy buckets long distances....... look what Tom invented!!! Ours was a 110 gallon storage tank that we filled from our home water, a garden hose with a ''mirafount fitting'' on the end, and our spare Mirafount. Next time we go camping with horses we'll have this same great setup! Gravity does the entire job!!!!! It took tom about 5 minutes to completely set up, including digging a small trench to bury the hose between the trailer and the Mirafount. Happy Horses, Happy People!!! Clicking the link gives Tips for Prevention and ''Cure'' of Equine Colic. This method has given us 99.999% success since 1976. We also use a great Non Toxic Fly Spray, healthy to horses, humans, and the planet! Growing up, my Daddy did not want to use ANY man-made soaps out camping, so he taught us to find the perfect clump of grass near a stream---pull up that clump, use the dirt attached to the roots to clean all pots, pans, and dishes, then re-plant the grass!!! In today's camping world, it's probably best to leave the grasses where they are and seek an alternative!! We love that ONE all-purpose, organic, Eco Friendly Cleaner that will clean dishes, hair, bodies, etc... plus help repel mosquitoes, flies!! Added bonus...should you get burned at the campfire, it takes away the pain and promotes fast healing! Should the burn be serious, a bandaid soaked with this same Eco Friendly Cleaner and applied to the wound will help the healing process. Pictured here is the very small kit we take when camping with horses. What a joy to keep it simple!!!! 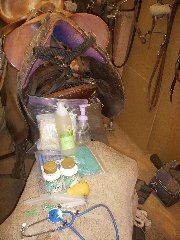 MOST IMPORTANT Portable Colic ''Cure'' Kit (Herbs, Banamine, stethoscope) that we take on all trips, long or short! Camping with Horses? 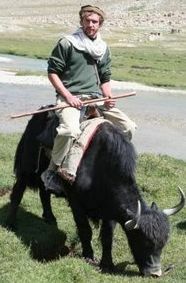 How about Camping With Yak? My dear friend Jacob Baynham, award winning Journalist, had a fabulous adventure in Northern Afghanistan, between the teeth of the Pamirs! And to enjoy more of Jacob's great world travels, visit him at Our Shared World. And come visit Our own Yak Family! And while you are camping, I bet you can come up with some great Horse Quotes while sitting around the evening campfire..... if not, take some of these great Horse Quotes with you! For some more great tips, visit Horse Camping!! 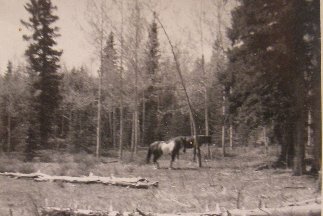 Have A Great Story About Camping With Horses? If you have a great story about camping with your horse, we'd love for you to share it! See the little blue ? mark? Click on it for helpful hints!! ADDED BONUS--each story you relate will become it's own webpage with it's own URL, so spin those yarns!